Correction: After this article was published, Microsoft clarified that the version of the Ask Toolbar it classifies as malware is not the current version. The latest version of the toolbar will not be banned by Microsoft as it does not contain search protection code. PCWorld regrets the error. It's good that Ask ceased its troublesome behavior. 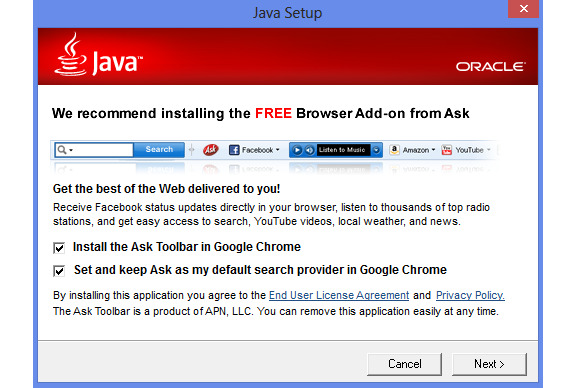 Unfortunately, it looks like you'll still be manually uninstalling the Ask Toolbar for the foreseeable future. —Ed. You know it, I know it, Wikipedia knows it, and now Windows knows it: The Ask Toolbar is a bad thing that nobody wants on their PC. The next time the Ask Toolbar tries to sneak onto your computer it will be marked as “unwanted software” (that’s a nice way of saying malware) by Microsoft’s security tools. Microsoft previously warned it would take action against software that tries to prevent users from changing their browser’s default search engine. Although the age of the browser toolbar is pretty much over, Ask’s Toolbar has managed to live on as software bundled with Oracle’s Java for Windows. In March, Oracle also extended the Ask Toolbar download to Macs. Bundleware is bad enough since even veteran PC users can be tricked into installing unwanted software—especially when you’re multitasking. But the Ask Toolbar has its own special annoyances. When installed it switches your browser’s default search provider to Ask.com, and when you try to switch away it attempts to prevent you from doing so with a pop-up warning. If you’re not careful the toolbar can also reappear the next time you update Java. But the power of the Ask Toolbar is no more, as first noted on Slashdot. Microsoft warned that as of June 1 any program containing search protection functionality—code that tries to stop you from changing your browser or default search settings—would be treated as malware. It appears Microsoft made good on its promise. Microsoft’s Malware Center now lists the Win32/Ask Toolbar as posing a “high threat to your PC.” The Ask Toolbar entry was first published in February, but was updated on Tuesday. Microsoft’s security products including Windows Defender on Windows 8 and up, and Microsoft Security Essentials for Windows 7 and Vista can now detect and remove the toolbar. The impact on you at home: This is great news for anyone who spends the holidays doing tech support for parents, aunts, and cousins. The Ask Toolbar is one of the leading annoyances most of us end up dealing with during those times. Now, however, Microsoft’s software should do all the heavy lifting allowing you to focus on reverting your sister’s default keyboard setting back to English and getting Outlook to download mail again on your uncle’s PC.